So I’ve been totally slack on blogging about the stuff I’ve learned this year as part of my goal to learn 12 new things in 2017. I’ve been learning stuff, but just not getting around to blogging about it. But I’m on vacay now, so I’ll have time to catch up on all the stuff I meant be blog about! And since I’m on vacation now, I’m also able to read books and finally finished reading the book that my friend Cath wrote: Introducing Epigenetics: A Graphic Guide . 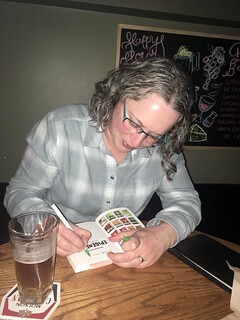 Dr. Cath, doing a book signing just for me! I’m not going to even try to summarize all the stuff that I learned about epigenetics – the book has a *lot* of information and if you want a solid introduction to the world of epigenetics, you should probably buy the book! 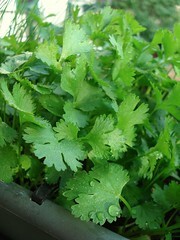 Cilantro is one of those things that either you love or you hate. And thanks to my friend Dr. Jen, I now know why! On our weekly Seawall walk on Saturday, Jen informed me that apparently there is a genetic difference between people like she and I, to whom cilantro tastes like pure freshness, and cilantro haters, to whom it tastes, apparently, like soap. My lazy attempt at finding the name of said gene1 came up empty, but apparently there is research that shows a high concordance rate for cilantro loving or hating between sets of identical twins compared to sets of fraternal twins, which suggests a genetic link. So, the ongoing fight that Kalev and I have2 – me saying cilantro is pure deliciousness and him saying it is disgusting – should actually be reframed, since what we are arguing about is not the “taste of cilantro” but rather about two different tastes of cilantro. It’s almost like me saying, “Candy is delicious!” and him replying “No, soap tastes disgusting!” Of course I wouldn’t like cilantro if it tasted like soap to me! And so I’m really glad that it doesn’t! And I’m actually kind of sad for cilantro haters that they will never know the pure joy that is the taste of cilantro as I experience it! Image Credit: Posted by Michael Lehet on Flickr.